I just added a page about why every Denver Home Buyer should hire a metro Denver Realtor with the following information. Many of us believe that if it sounds too good to be true, it probably is. The truth is that buyers really do get professional services for free. How are Denver Area Realtors Paid? Before we can talk about why it is a misconception that buyers pay more when they have their own Denver Realtor, you need to understand how Realtors are paid. Almost all Realtors work on 100% commission. No salary, sick days, or health insurance. Home sellers hire listing Realtors to help them sell their home. The Realtor charges the seller a commission on the total sale price, typically somewhere between 5-7% for a full service Realtor. Listing Realtor only get paid if they are able to get a contract on the home. If the home doesn’t sell, then the Realtor makes nothing. Since there are thousands of Realtors, and thousands of buyers, the chances that the listing Realtor will actually locate a buyer for the home is slim. So, listing Realtors offer to pay a portion of the commission that they receive to the buyer’s Denver Realtor that represents the buyer who purchases the house. But, it rarely is just a split between the 2 Denver Realtors. Most of the time, the Denver Realtors work under the umbrella of a brokerage. Both Denver Realtors split their side of the commission with their brokerage. Depending on the brokerage and the Realtor’s production level, the portion that the Realtor keeps is typically between 50-70% of their side of the deal (there are a few company’s that offer plans where Realtors can pay upfront fees and keep up to 95% of their commission). When a buyer calls the listing Realtor directly, some Realtors will try to talk the buyer into not using their own Realtor. The reason that they do this is obvious. If there isn’t a buyer’s Realtor assisting the buyer, then the listing Realtor doesn’t have to pay out a portion of the commission to the buyer’s Realtor/buyer’s broker. Many buyers assume that listing Realtors will reduce the commission charged to the seller if there isn’t a second agent…and thus the home seller can sell for a lower price. Usually, this simply is not true. There is a lot of work that goes along with assisting buyers after a contract gets accepted. When this work isn’t done, contracts can fall apart. Homes go unsold and Realtors don’t get paid. To make sure the deal closes, listing Realtors will add the buyer side details to their list of things to do when a buyer’s Realtor isn’t involved in the transaction. Most listing Realtors don’t want to do all of that work for free. If they reduce the commission to the seller by the amount normally paid out to a buyer’s Realtor, then the listing Realtor does twice as much work for the same money. What is Transaction Broker Agency? Some listing Realtors will offer to assist the buyer while only representing the seller. This means that the buyer has no one advocating for their rights, since the listing Realtor is working for the seller. More often, the listing Realtor will offer to work under Transaction Broker Agency. Transaction Broker agency means that one Realtor represents both the seller and buyer in the same transaction. If you call the listing Realtor from an ad or off the yard sign, or walk into an open house, you will often be setting yourself up for the listing Realtor to try to talk you into transaction broker agency. Whether you are the buyer or seller, having your Realtor represent the other side means that your Realtor cannot advocate for you in negotiations. Your Realtor can present options for you, but can’t help you decide which approach is most likely to get you what you want. Buyers and sellers don’t benefit from dual agency. The only people who benefit from dual agency are listing Realtors that keep the entire commission. And, it truly is hard to disconnect from their original allegiance to the seller. How Do We Handle Transaction Broker Agency? 1. As a seller’s Realtor, we can assist them with the paperwork and the contract details just as a store salesperson can assist the people that are purchasing products from the store. We will be representing the seller and will encourage the buyer to accept the terms that the seller wants. By the way, this is exactly what new construction salespeople are doing when a buyer purchases a new home without a buyer’s Realtor. THE BUYER HAS NO ONE ADVOCATING FOR THEM AND THESE CONTRACTS CAN BE MESSY! 2. We can refer the buyer to another good Denver Realtor that can act as a buyer’s Realtor and represent the buyer’s interests. We would much rather have a good Realtor of the other side of the deal, doing the work to make sure that the deal closes, than have a deal fall apart when an unprofessional Realtor fails to stay on top of contract details such as loan and appraisal contingencies. 3. 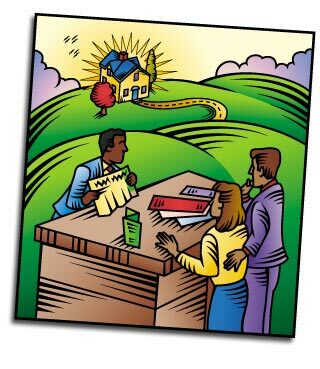 The buyers can find a Denver Realtor on their own who can represent their interests in contract negotiations. If you discover a home through an ad or a yard sign, call an Denver Realtor that will represent YOU and not try to sell you on transaction agency.